Social media is a great place to stay in contact or gain new insight into the lives of ….well, anyone. Movie stars, comedians, politicians, athletes. It’s interesting (if not a bit voyeuristic) to get a brief insight into their daily lives. It’s no different with the endurance community. There are many athletes out there that shoot little tidbits off about how much time they spent on the bike or where they ran to today. From my viewpoint as a father, husband, business owner etc etc, the amount of time they put in and the intensity of the workouts is impressive, primarily because I have nowhere near the time to do what they do. And perhaps I’m a little bit envious at times. In a recent build up to a big race — in this case a full distance Ironman™ triathlon — through Instagram, I saw an athlete swim 5000m at the early morning pool session. Later in the day he rode about 110 miles averaging about 22 mph on a ride with hills, and finished off with an 8-mile trail run. That was not a terribly rare occurrence. It’s understandable that many athletes may look at these numbers and it’s a bit romantic to think of training like a pro does. I don’t think they believe they’ll have the same success, I think many athletes just want to “train like a pro” for a number of reasons. Pride? Toughness? Bragging rights? But an athlete without the endurance history (definition: for how many years have they been putting in 10-25 hours a week of training?) AND with a job and/or a family is setting themselves up for failure by doing this. Because what you don’t see is the time and the effort (or lack of it) that goes into the recovery process. Among the best athletes in the world, recovery is treated like an additional job. Significant time and resources are set aside for it. Frequent massages. Daily naps. Simple couch time. Expensive compression devices. Carefully crafted diets. Early bed times. When planning a training program, the amount of time an athlete has for training isn’t the primary factor…it needs to be considered whether they have time to recover from those workouts. Planning your recovery as part of the training is key to having high-quality workouts. By over-planning the training and under-valuing the recovery time, most athletes end up with a lot of junk workouts because they had to sacrifice on intensity or length. I consider a workout ‘junk’ if it didn’t advance your endurance, it didn’t make you faster, or it didn’t aid in your recovery. That elite triathlete on Instagram told us what his workouts were that day — what didn’t make the feed was the recovery job he undertook that day. Head back to the house where a friend that’s a chef had prepared coffee, eggs, avocados, with homemade tef tortillas and some salsa. After breakfast, spent about 30 minutes doing some basic mobility exercises with some light yoga. Then was able to lay down with feet up for about 30-40 minutes and read a book. Got up and started to get ready for the bike ride. Got off the bike and spent 30 minutes easing into some light mobility work (no aggressive stretching and low exertion level). Plenty of hydrating. Transitioned to a late lunch of chicken, quinoa salad, mixed greens and dessert. Spent 40 minutes in a pair of sequential compression devices for the legs while surfing on his tablet. Went down for a 90 minute nap. Light snack and more hydration. Some days he might spend 15 minutes with a movement/massage therapist to get the muscles warmed up and ready for a run. Head over to the trail. More mobility work as the cool down from the run begins. More hydration. Light snack. A little more couch time (or just time off the feet) and then dinner — some fish, rice, veggies, French bread, and dessert (okay and a second helping of dessert). Couch time reading or watching TV. In bed by 8:30 to do it all over again tomorrow. Also we shouldn’t forget that this pro athlete also has numerous years of training in this manner under their belt. It’s difficult to quantify the actual effect of this “historical fitness” but when you see the length and intensity of certain workouts done by elite athletes, it’s hard to ignore this factor in their ability to absorb these workouts. Do you have time to recover like this? I know I don’t and I’m betting most of you out there don’t as well. I can get up in the morning and swim for an hour or more before work. But then instead of eating a healthy breakfast, working on my flexibility for a half hour or more, I have to grab something quick to eat, get my sons up and off to school and then head to work. I could schedule in a long bike ride in the middle of the work week if I had to (meaning if it would significantly improve my fitness), but instead of follwoing it up with another relaxed meal, some stretching, and a nap and some significant time off my feet, I’d, again, have to rush back to my responsibilities. By not resting and not getting off my feet for a period (and sitting in front of the computer doesn’t count) not only would I not be recovered in time to run later that afternoon, but I likely would have to take the next day easier as well. And that’s the big difference: the combination of historical fitness and time spent on recovery allows elite athletes to put in day after day of hard work, while regular people would break down doing even a fraction of this. So how to best train with a ‘normal persons schedule’? Intervals: They’re not fun to think about, but they’re surprisingly enjoyable when you get into a healthy diet of them. Also they are the perfect addition to the training plan for any busy athlete. Don’t have time for a 90 minute run after work? Go out for 50 minutes, and after 15-20 of warmup, do 3-minute intervals at 5K pace or faster with 4 minutes of rest between. Do 3 or 4 of these and cool down a few minutes and you have a workout that is ‘worth’ more than your average 50-minute run and might even leave you enough time for some stretching and trunk strength work. Sleep : It’s usually the first thing to suffer and it shouldn’t be. It’s when we do most of our actual recovery and when it’s sacrificed, training suffers. Studies have shown that sleep loss has a greater effect on sub-maximal (read as “endurance”) performances. π So it’s more critical for endurance athletes to get more and better rest. Want to train harder, or more importantly, to get more out of your training?….then sleep better. So to train like a pro, you need to recover like a pro. Plan workouts you can do but also make sure to schedule time for recovery. I am certainly no expert on cycling aerodynamics but figuring this out became a bit of a mission. In the process I learned quite a bit about aerodynamics and the equations that go along with it. I am unsure of a few parts on here (and I note when below) but I reasoned through these as best I could. I’m actually interested if someone with more background in this field finds my missteps and can explain where I got derailed. Here is the main equation we’re working with and a breakdown of each of the variables. I substituted in some reasonable approximations (or what I assume are reasonable) that I got from Chris at the FLO Cycling blog in order to start off the process. This was one aspect of cycling aerodynamics that surprised me….counter-intuitively the time savings is less the faster you go because the rider is out there less time and therefore doesn’t make use of the drag reduction for as long. For example, the time savings of 36 drag reduction is only about 17 seconds at 28 mph. Pretty interesting results regardless of where (and if) I went wrong. So aerodynamicists and experts please let me know in the comments or on Twitter, Facebook, etc what you think. The sport of triathlon loves it’s aero bikes. No doubt about that. After all, they look cool, they put us in an aerodynamic position, and they’re really fast, right? Right? Well, they can be fast, but often I think athletes over-estimate how fast they make them. Very aero triathlon bikes (and time trial bikes for that matter), and by this I mean bikes with non-round tubes that are generally made of carbon, are often built with proprietary front ends (bayonet-style head tubes and the like) and designed to create a very aggressive riding position, so many times they have very short head tube lengths. Short head tube means a low handlebar position that many riders might be able to reach, but not necessarily generate power from. If an athlete is positioned outside of their optimal range for power development then power output (and speed) goes down. Poor fit equals poor power. Period. If the fit is jerry-rigged (we’ve all seen the triathlete on the $10,000 bike that has the stem jacked up) then at the very least the benefit of the frame isn’t being taken advantage of. But let’s not go there yet — let’s assume a rider can assume the position that the bike frame offers. What exactly is the benefit of the aero frame itself? Of all the changes you could make to your setup — helmet, wheels, aerobars, skin suit, shoe covers, POSITION — the frame accounts for the least amount of benefit. But let’s look at how much that benefit is. I pulled this chart and graphic from an article written in Velo News a few years ago done by the group at Aerosports Research looking in depth at the aerodynamic benefit of different components. This graphic provides the number of seconds of improvement a rider would see over a 40 km (24.8 mile) time trial. This is exactly the distance of the bike leg for an Olympic distance triathlon. To be able to compare aerodynamic drag numbers, we have to always test at the same speed — in this case 28 miles per hour, which, yes, is pretty darn fast. The benefit that an aero frame (this is in comparison to a round-tubed TT bike that also puts the rider in the tucked position on aero-bars) provides is a 30 gram difference in CdA which translates into covering the 40 km time trial course 17 seconds faster. How can we put that improvement into perspective? First, just compare it to some of the other components….it’s definitely on the low end. My next question then was How much power improvement do we need to make up 17 sec over 40km? Meaning, how much harder would I have to pedal to make up this same amount of time? Let’s do the math. Let’s say you’re a 160 pound triathlete and your bike weighs 20 pounds. So the combined weight of you and your bike is about 180 pounds or about 80 kilos. You’re a pretty good Olympic distance athlete and your time for the 40 km bike portion is 1:07 (so you’re riding a smidge over 22 mph). This requires you to push about 208 watts for that 67 minutes. You’re debating whether to drop $5000 on a fancy shmancy new TT bike and wondering if you should pull the trigger. Let’s assume that the new frame will garner you the entire 17 sec of benefit (even though those measurements were based on someone going much faster than you — actually they would be pushing north of 350 watts! — at 28 mph). Guess how many more watts you’d need to push to make up 17 seconds in the absence of the new frame? 4 watts. Actually no, 3.7 watts to be more accurate. The smaller you are, you’d need even fewer to make up the difference. Still think that $5000 frame is worth it? Now this 4 watts is considering a flat course and a calm day. Certainly throwing in some hills and a stiff breeze changes the watts necessary to ride at this speed. But I’m not arguing that aerodynamics and cheating the wind isn’t important. 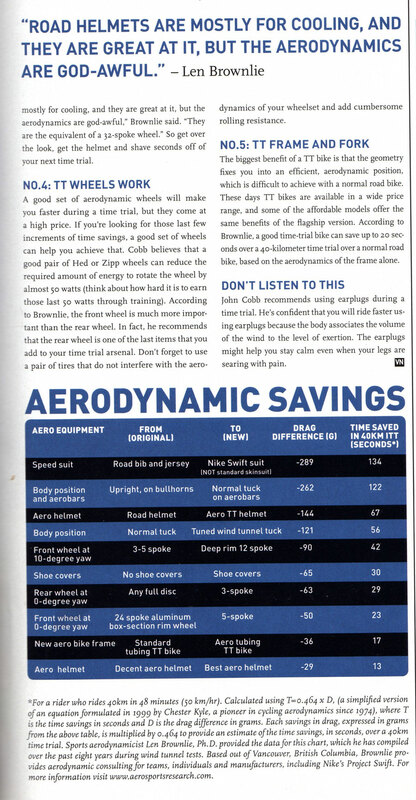 My point is that that the aero triathlon bike isn’t helping riders as much as they think. What’s important is that regardless of the wind, the power needed to overcome a relative wind speed doesn’t change. Relative wind speed is basically that no matter if you’re going 17 mph on a completely calm day it will require a given number of watts to hold this speed. It’s the same number of watts (for that rider) to ride 12 mph into a 5 mph headwind. Additionally, that aero frame may be worth 36 grams of drag reduction at 28 mph, but a how many grams of reduction does it get you at 20 mph? Or 17 mph? Not 36 grams worth, that’s for sure. Still worth the $5,000? How about $3,000? Again, all the previous arguments were assuming that you can get into the position that the frame was built for. What does this position look like? It means that the rider can spend 95+% in the aerobars while having a reasonable number of spacers under the stem and aero pads (<30 mm under each) and a stem with less than 15° of rise (although a case could be made for one with under 10°) AND still generate consistent power throughout the entire race distance. What happens when you can’t get that aggressive? What if you need to raise the stem up 15-20 degrees or add spacers under the stem? Are you still getting the full aero advantage of that frame? I am no expert in a wind tunnel, but I have spent some time in them. One thing that becomes clear in that environment is that aerodynamics isn’t a 1-to-1 equation where everything is black and white. For example, it would seem that you should be able to take the fastest wheels and pair them with the fastest frame and have the fastest bike, but the truth is that it’s actually a much grayer proposition. Bike components (and riders!) interact in strange ways, such that you could have the best intentions of improving your aerodynamics by getting a set of aero wheels but they might not play well with your frame and the result is, if not bad then at least less than optimal. Rider position is no different. It might seem logical that even if a rider has a bad position on their bike, the frame itself being more aero will provide benefit and may make up for the rider’s shortcomings in fit. The truth is that there’s a good chance it won’t. A frame’s aerodynamics are drastically effected by how the air comes off the front end of the bike and meets the rider and again how the air comes off the rider to meet the rear of the bike. Referring back to being able to generate consistent power, if a position is too aggressive and a rider has to sit up on the bullhorns to stretch their back, any small benefit the aero frame is producing is far out-weighed by the increase in drag from the entire body sitting up in the wind. In cases when a rider has difficulty maintaining the position of their aero steed, it’s my firm belief they would be better off either saving their money and getting a cheaper time trial frameset, or building a custom time trial frame (and still probably saving money relative to the higher end TT and triathlon bikes). A custom bike, even a round tubed version in many cases will be a faster alternative for many triathletes and TTers. Why? First of all, a custom bike can be designed to create a position for the rider that is the optimal intersection of their power generation as well as their aerodynamics. An athlete that’s in a neutral body position will be more powerful. Additionally, from a bike fit standpoint, a neutral custom-made position results in fewer dynamic deviations like “flailing knee” tracking issues and the rider sitting more squarely in the center of their bike** — both factors that could absolutely improve aerodynamics. Since the rider’s body accounts for most of the aerodynamic drag, optimal body positioning will always provide the most improvement in aerodynamics. Even the researchers in the article mentioned above note that “The biggest benefit of the TT bike is that is fixes you into an efficient aerodynamic position…” — NOT that it’s aero-shaped tubes cut through the wind drastically better. Nuts and bolts on cost for something like this? If you want to stick with carbon as your frame material of choice in aerodynamic tube shapes, it’s still going to cost a fair bit — likely anywhere from $4,000-$10,000 for the frameset (frame and fork). The whole point of this article however was to elucidate how little those aero tube shapes are benefiting you. If you opted instead for a steel or titanium custom frame you’d be spending much less — in the ballpark of $2,000 for steel and $3400 for titanium — or basically the cost of entry-level and mid-level triathlon frames respectively. Aerodynamics can in fact be “free time” because you don’t have to work any harder and yet you go faster. I am a huge proponent of getting the most aerodynamic benefit you reasonably can and there are plenty of changes to explore. 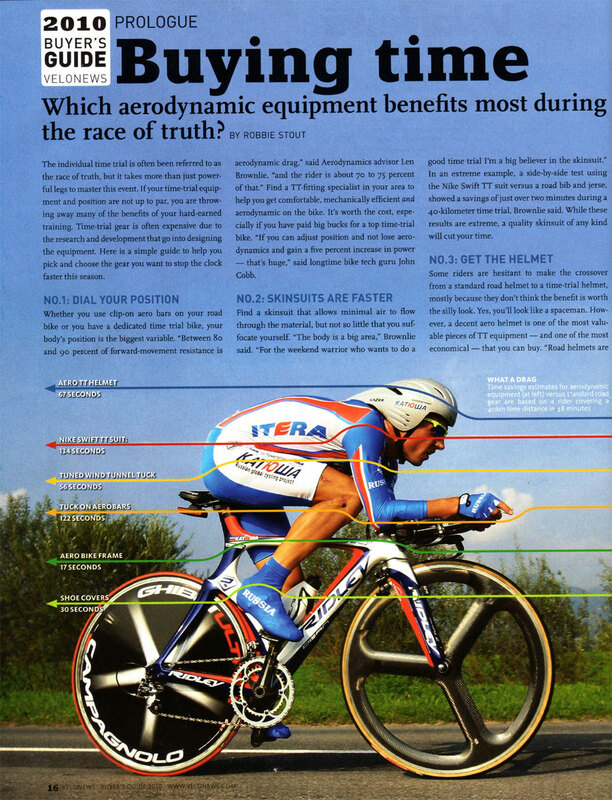 But the aero triathlon bike never quite made sense to me….it’s a huge cost with a pretty low up-side. Not great bang for your buck. So explore your non-aero options — they could be cheaper, or more comfortable, or more powerful, or all of the above — with a chance that they could be more aero overall too!